Members of the community attending the January 23 meeting on the future of McLennan’s H.W. Fish Arena. Approximately 30 people attended the Parks and Recreation and the Town of McLennan community meeting to discuss the future of the H.W. Fish Arena, as the future of the facility has been in doubt. On the subject of the arena running an annual deficit the consensus is that increasing usage of the facility is more important to justify the shortfall, as just about all municipal arenas run a deficit. 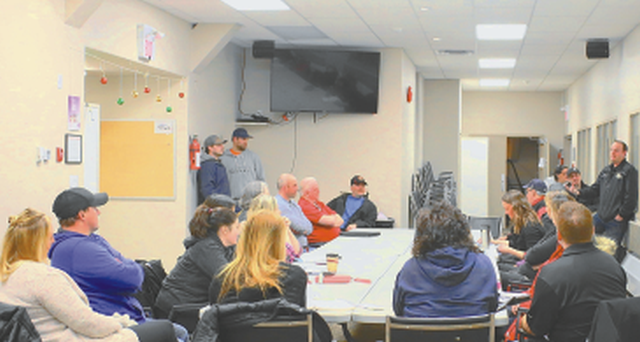 Among those who attended were members of the McLennan Rec Board, Town Council, Mark Fournier president of Smoky River Minor Hockey along with parents and community members. Everyone at the meeting recognized that the Arena is an important feature to the wellbeing and stature of the community, and an asset in drawing families to live in the town. Combined with lower population, there are fewer minor hockey teams in the Smoky River Area, no North Peace Hockey League team using the facility, a fall off in recreational hockey and no figure skating. Other factors under discussion were having three Arenas in the immediate area and acknowledging the decline in utilization, and that cooperation and some innovative thinking might benefit all three municipalities. Some of the proposed uses for H.W. Fish Arena are indoor soccer, lacrosse, which is seeing resurgence in popularity, and making greater use of the arena’s upstairs lounge as a means of generating revenue. While no definitive initiatives were decided upon at the meeting, the tentative plan is to establish an Arena subcommittee with a long-term commitment to making the arena viable. The subcommittee will be exclusively responsible for the arena under the auspices of the McLennan Parks and Recreation Board who will offer its assistance to the subcommittee. A list for potential volunteers circulated at the meeting was signed by the majority of those present. The original question the McLennan Parks and Recreation Board and the Town of McLennan put to McLennan residents is whether they can create ways to increase utilization of the facility, is the community prepared to take action and help fundraise to sustain this facility and does the community want the arena. Judging by the meeting, the response to those questions is an overwhelming yes; McLennan residents want to keep the H.W. Fish Arena.